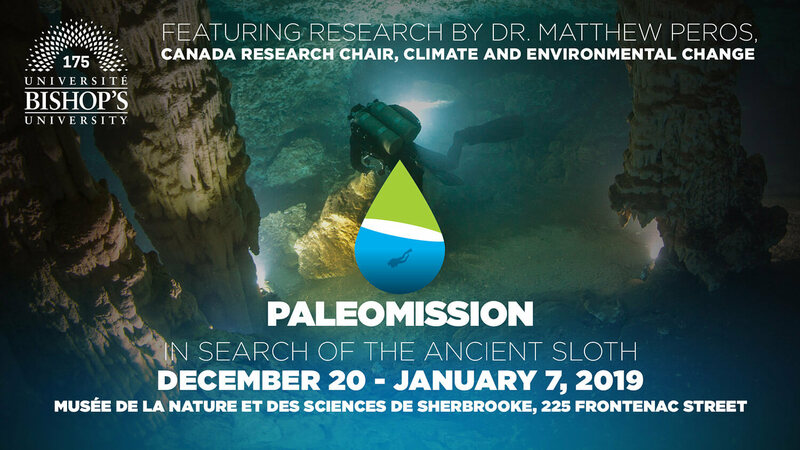 Paleomission: In Search of the Ancient Sloth, a new exhibition at the Musée de la nature et des sciences de Sherbrooke (MNS2), is based on research by Dr Matthew Peros, Bishop’s University’s Canada Research Chair on Climate and Environmental change, and presents findings on the remains of two species of prehistoric sloths found in underwater caves in Cuba. The exhibition is another illustration of Bishop’s University academic excellence in action through research conducted by outstanding faculty, as well as a fascinating knowledge mobilization opportunity for the wider public to benefit from academic research. The exhibition is the result of collaboration between Bishop’s University, the MNS2, the National Museum of Natural History in Cuba, the National Geographic Society, and the Ministère des Relations internationales et de la Francophonie du Québec. The exhibition will be on display at the MNS2 starting on December 20, 2018 until January 7, 2019, and is an excellent outing idea to entertain visiting family and friends over the holiday period.